What is the point of a baby monitor with night vision? We look at each other. One of us needs to make the move to go and check on the kid. It’s a standoff. First one to blink has to go and check. Wouldn’t it be easier if you could pick up a baby monitor with night vision? You can easily take a look to make sure everything is cool, before wasting more of your life watching TV (Clearly, I am not talking about Sport here). A baby monitor is an extremely important part of your Dad kit, it is something I still insist on keeping on, despite my offspring approaching his 4th birthday. It is reassuring, knowing that I will be alerted to any issues that need Dad intervention. Electromagnetic radiation is a measurement of wavelength, specifically for the range between 100nm (nanometer) and 1mm. Your eyes can naturally see light in the VIS section, which is between 400nm and 800nm. When it gets dark, you need to be able to view objects within the IR range, which is where Invisible Infrared (IR) can help you out. Most of the baby monitors (along with dash cams, security cams etc) that offer night vision utilize Invisible Infrared (IR) technology. Basically, the camera will have LED’s blasting out ‘invisible’ light that your camera can see. The light from the LED’s will enhance the video and will let you see what is happening without missing the game. There are options out there that do not use the ‘Invisible IR’ technology. These baby monitors have LED’s that emit a red glow, which can be picked up by the naked eye. I have a cheap security camera that has a red glow to the LED’s, which pretty useless as a covert device…..but at least it lets people know it is there! Wait, Did You Say Radiation? Is My Kid Safe With These? When I think of the word radiation, the very next word is Nuclear. Alarms bells start ringing, but do not panic! Ultraviolet, x-rays…these are the types of electromagnetic radiation can be dangerous. Infrared is not dangerous – you guys know that! The light that is visible to your eyes is also a form of electromagnetic radiation….that is not dangerous either, thankfully. The HelloBaby 3.2 Inch Video Baby Monitor with Night Vision has some excellent features! HelloBabys option has a 3.2″ color screen with night vision, temperature monitoring, and a 2-way talkback system. You can pair this with up to 4 cameras, just to make sure you cover all angles! That is one of the features that make it the best night vision baby monitor. The other feature I love is the 8 lullabies that can soothe your kid to sleep….hopefully! Oh, it also has an air temperature meter! With a range of up to 984 feet (quite specific there!) you can be sure you have more than enough coverage throughout your house. Highly rated night vision Baby monitor! The Infant Optics DXR-8 Portable Video Baby Monitor is an excellent choice for a baby monitor with night vision. A brilliant all-rounder, this Baby Monitor utilizes ‘Invisible Infrared’ technology to ensure you get a live stream of your sleeping offspring in excellent quality! Whilst the manufacturer boasts a 700 feet operating range, this will not be the case in your home. The most likely range will be around 200 feet by the time with wireless signal has smashed through all your other electrical stuff. The monitor comes with a 3.5″ full-color LCD screen that you can use to pan, tilt and even digitally zoom in, just to make sure no-one has swapped them out for another kid. With the temperature monitoring system, you can also make sure they are not too hot or too cold. You can expect the monitor to last 6 hours with the screen on, and 10 hours in power saving mode. Awesome looking, and easy to use! This white 2.4G wireless baby video monitor with night vision has all the features you need! It comes with a 3.2″ digital color screen and it can stay on for up to 20 hours! Indoors, with obstructions, you can depend on the signal for up to 160 feet. If you live without walls, door, and any other electrical item, you can go all the way up to 850 feet. You will probably be cold though. And bored. Features include temperature monitoring, 2-way talk and 8 lullabies to sent your baby back to sleep if they begin to stir. In the dark, you are able to see up to 15 feet with this baby monitor however, it is not ‘invisible infrared’ so you will be able to see a glow from the LED’s when in use. Another highly rated night vision Baby monitor! Here is another excellent and cheap baby monitor with night vision. This wireless video baby monitor is very similar to the options above, with all of the features you need. 2-way talk, temperature monitoring optical pan and tilt, 2 x digital zoom, a sound activated LED and automatic night vision. The viewing angle is 60 ° and can be rotated a full 360 ° too, just in case you want to monitor the wall. 4 lullabies can be remotely activated, so you can sooth the kid from afar! Speaking of distance, you can expect around 200 feet in an enclosed space. Free of any obstacles, you can get up to 960 feet. That’s not much use but I thought I would tell you anyway! Great looking camera, reliable base unit! The new version of the EtekStorm is as loud as you will need it! The 2.4″ screen is not as big as some of the other options on this page but the picture clarity is awesome. Again, similar to the others on this page, it has a temperature sensor, which is an excellent add-on. The transmission range is just over 160 feet indoors, and without barriers, it can reach over 800 feet! Features include 2-way talk, 4 lullabies, and infrared night vision. You really cannot go wrong with the EtekStorm AND it is the cheapest one here! With so many choices out there, it was a challenge to find the best night vision baby monitor, but we have 5 above that offer excellent features, excellent value for money and increased Dad reassurance. Night vision baby monitors are extremely useful and are a very important part of your kid kit. You need to minimize the chances of something bad or messy happening….and these are needed to make sure you know what is going on in the dark. 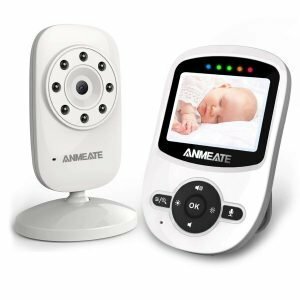 If you are looking for a baby monitor with night vision, we are sure you will find an excellent option here on this post. If you think we have missed something out, or you have a good/bad experience of one of the recommended products, please contact us!